Works only with roll-up signs. 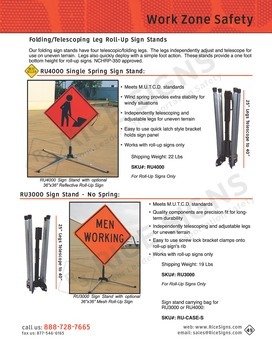 See Folding Sign Stand for Roll-Up Signs in our catalog on page 49. Our folding sign stand for roll-up signs has four independently adjustable legs. Roll-up signs mount to the stand with a screw lock type bracket. Deploys quickly and works with uneven terrain. How it ships - The folding sign stand fits snugly into a specialized box for shipping via any standard carrier. Shipping dimensions are 7"x7"x27" and the weight is about 20 lbs. The Universal Bracket works with any standard roll-up sign, regardless of sign manufacture. It simply clamps onto the upright fiberglass rib and securely holds the sign in place. Guaranteed to never jam up, unlike like some latch brackets. 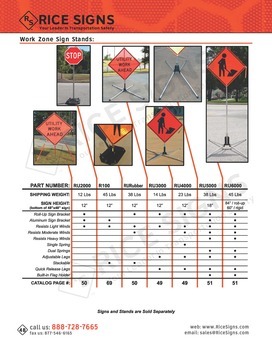 Works with roll-up signs with any plastic corner pocket or sewn fabric corner pocket. 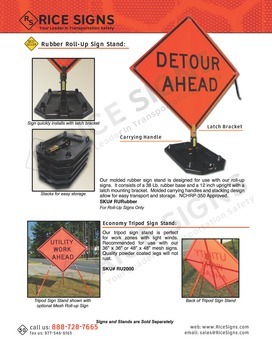 RU3000 Folding Sign Stand shown with optional 36"x36" Reflective One Lane Road Ahead roll-up sign. 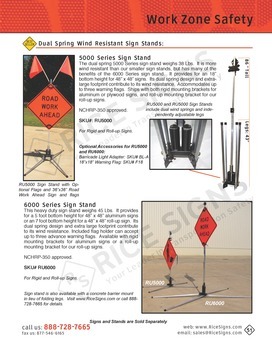 The sign stand provides a sturdy footprint to keep the roll-up sign from tipping over.